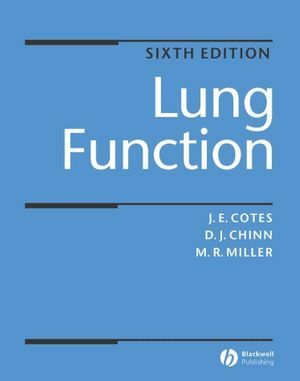 "I have always considered Dr Cotes' book the most authoritative book published on lung function. It is also the most comprehensive." "I think I can fairly speak on behalf of staff in lung function departments the length and breadth of the country - that a sixth edition of Cotes would be gratefully received." 18. Inter-relations Between Lung Ventilation and Perfusion. 22. Gas Exchange for Carbon Dioxide and Acid-Base Balance. 24. Newborn Babies, Infants and Young Children (Ages 0–6 years). 27. Genetic Diversity: Reference Values in non-Caucasians. "I have always considered Dr Cotes' book the most authoritative book published on lung function. It is also the most comprehensive. I strongly support a sixth edition." "I am delighted as chairman of the ARTP to consider the proposal for a sixth edition of John Cotes' book. I think without exception every lung function laboratory will have an earlier copy of the book (indeed I am the proud owner of the first edition myself!). I felt that the fifth edition was a marked improvement on earlier versions, particularly with respect to the layout, as well as the updated content. To update the content further and to involve more authors, but maintaining John's direction, will product a valuable update to the book. "I hope my comment will help you to reach a positive decision...I think I can fairly speak on behalf of staff in lung function departments the length and breadth of the country - that a sixth edition of Cotes would be gratefully received." "The proposed new edition will be a revitalised version of a familiar and respected text...The primary author is obviously still enthusiastic and energetic enough to complete the project but has sensibly taken on collaborators to refresh the style and widen the perspective...The book is likely to have the advantage over its competitors in terms of existing stature. Also it does provide a role as a reference text for laboratories and departments." "the most authoritative book published on lung function ... the most comprehensive. "